Christie's, New York, 18 October 1993, lot 43. 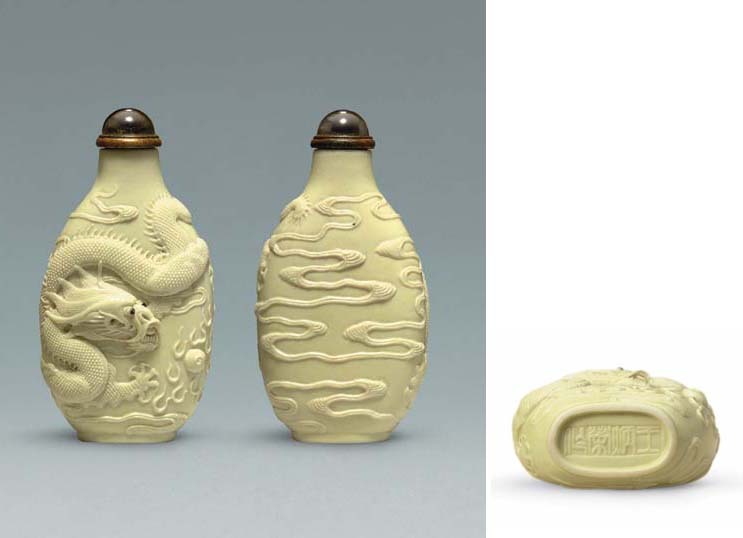 For a similar bottle see the exhibition catalogue, Chinese Snuff Bottles, Hong Kong Museum of Art, 15 Oct-26 Nov, 1977, fig. 75, and R. Kleiner, Chinese Snuff Bottles from the Collection of John Ault, 1990, fig. 154, where the author states, "a series of bottles by Wang Bingrong is known, depicting dragons on a pierced cloud ground, but this bottle is a much rarer treatment of the subject." Wang Bingrong was one of the finest of a small group of independent ceramicists of the nineteenth century who began to emerge from the traditionally anonymous production of ceramics at Jingdezhen by signing their names, developing distinctive styles and acquiring fame. His dates are not known, but Wang probably worked from sometime during the Daoguang period into the second half of the nineteenth century. Dragons were among Wang's more popular designs, although this particular design is among his rarer works. They are usually covered with pale, pastel monochrome enamels. Other comparable examples include a yellow-enameled example illustrated by L.S. Perry, Chinese Snuff Bottles. The Adventures and Studies of a Collector, p. 84, no. 64; two bottles, one covered in a pale yellow enamel, the other in a very pale green enamel mottled with brighter green splashes, illustrated by B. Stevens, The Collector's Book of Snuff Bottles, p. 93, nos. 263 and 265, respectively; a pale duck-egg-blue-enameled bottle illustrated in Zhongguo Biyanhu Zhenshang, no. 161; one covered with a yellowish-cream glaze, also with clouds on the reverse, illustrated by H. Hitt, Old Chinese Snuff Bottles, p. 66; and an example left in the raw biscuit state achieved after the first firing, illustrated by R. Kleiner, Chinese Snuff Bottles. The White Wings Collection, p. 140, no. 94. This group of bottles is usually categorized as monochrome, although strictly speaking it is not, since the eyes of the dragons are always enameled in black. It is interesting to note with Wang Bingrong's series of dragon bottles that no two are identical. In each case the design was considered afresh with the dragons in different positions, suggesting that the designs owed nothing to a mold, but were entirely carved by hand, even if the initial shape of the bottle was derived from a mold.